The cost of keeping a customer is much less than the cost to get a new one. So customer retention should be a priority. Can going green be the key? 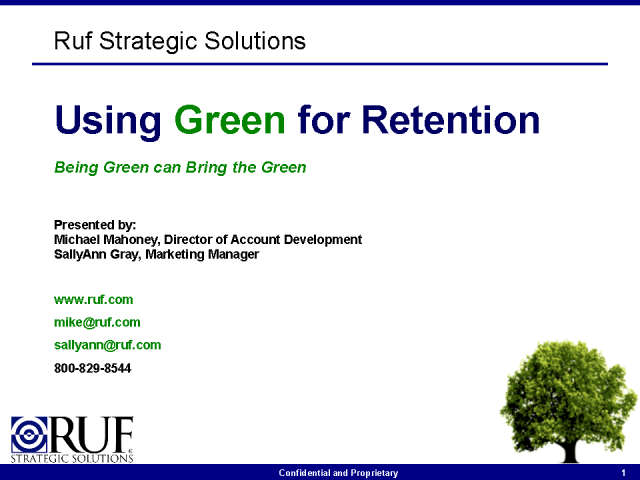 This session will discuss how using market research about your consumers’ green propensity can help you retain your greenest customers. Learn how to effectively focus your message to resonate with this audience and strengthen customer loyalty. Data from a national study by Ruf Strategic Solutions, a marketing research company, identifies U.S. households with high environmental concern who currently practice sustainable consumerism. The Green Consumer Index (GCI) is a score that ranks U.S. consumers by their green attitudes and behaviors. The score is used to rank more than 100 million consumers in the U.S. and defines green consumers by their demographics, geographics, psychographics, lifestyle characteristics, buying behaviors and media preferences.